Also in the loft the start of the Red Force armour, an Airfix soft plastic T34. Although not the best detail these little models fit the "toy soldier" vibe I am aiming for. I made a mental note to keep an eye out for more at toy and wargames shows. The obvious prototype from the 1950s for our Red Force to be based on is the Communist protagonists from the Korean War. These included North Korea and China on the ground and the USSR with (secret) air support. So for reinforcements I picked up a few boxes of the IMEX Korean War figures. The IMEX figures are nice enough. At the rigid end of toy soldier plastic and well proportioned and detailed. Red Force are being painted up in a lighter khaki colour that seems to suit North Korean Army uniforms. They will also look about right for other Soviet equipped infantry in the Middle East and Asia. 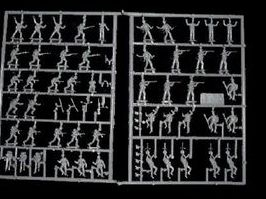 There are 48 figures including 2 nice little mortars. No heavy machine guns though. 8 of the figures are casualties or surrendering, which seems a high proportion but they might be useful as unit status markers.